With the Zoll AED Plus Semi Automatic External Defibrillator you can have the confidence that if a cardiac arrest emergency occurs your restart response will be instant. Shocking the heart back into beat promptly will continue blood flow from the heart limiting damage to the brain or other vital organs. 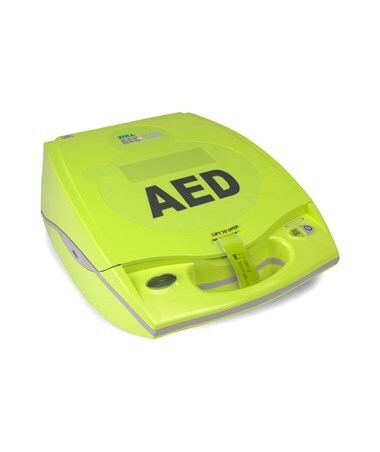 This AED includes Real CPR Help to ensure that critical CPR is given correctly for optimal resuscitation efforts. In addition to high-quality automated defibrillation, the AED Plus provides Real CPR Help® to ensure that critical CPR is given correctly for optimal resuscitation efforts. 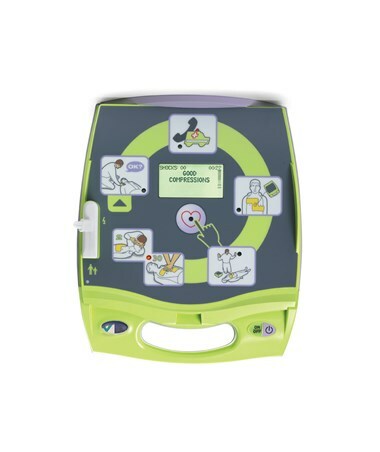 Audio and visual CPR assistance, coupled with spoken prompts and graphics depicting every link of the Chain of Survival (early access, early CPR, early defibrillation, early advanced care) help inexperienced users perform high-quality resuscitation efforts every step of the way, making the AED Plus the world's only Full-Rescue AED. Real CPR Help® coaches responders to perform CPR correctly with real-time feedback, prompting users to begin compressions, push harder, and continue CPR, along with messages confirming that the CPR is being done effectively. It displays compression depth, compression rate, and lapse time indicators to ensure that CPR is consistent, properly timed, and deep enough; it also combines all three compression functions into the CPR Index™, one visual indicator that allows users to view the quality of their CPR efforts and adjust as necessary. Audio prompting urges users to "push harder" and "continue CPR," and exhorts "good compressions" when CPR is done correctly. To help with the timing of compressions, a metronome programmed to the correct rate will sound. The monitor is also capable of transmitting CPR data for review and playback of resuscitation efforts. Zoll has implemented most innovative digital technologies to its AED Plus series in attempt to make the emergency situations as stress-free as possible. As a result, the AED Plus Fully Automatic model simplifies the process of CPR delivery to the maximum. The Fully Automatic unit takes the charge and delivers shock with no assistance from the side. The AED starts a 3 seconds countdown so you know when to stay clear and await the shock. The count down is shows in a form of the text on the screen in addition to an audible alarm. This External Defibrillator increases the chance for survival allowing the early intervention in the situations of a sudden cardiac arrest. The unit utilizes rectilinear biphasic technology for superior performance with less energy use. Contrary to popular belief, defibrillators with higher energy settings are not more capable than others. The rectilinear biphasic waveform has shown superior results in defibrillation at 200 J (compared with the average 360 J of other biphasic waveforms), delivering the right amount of average current over the optimal duration to high impedance patients. The AED Plus includes one of Zoll's revolutionary electrodes, CPR-D-padz®. This innovative pad combines the typical (and confusing) two-electrode system in one pre-connected simple entity. 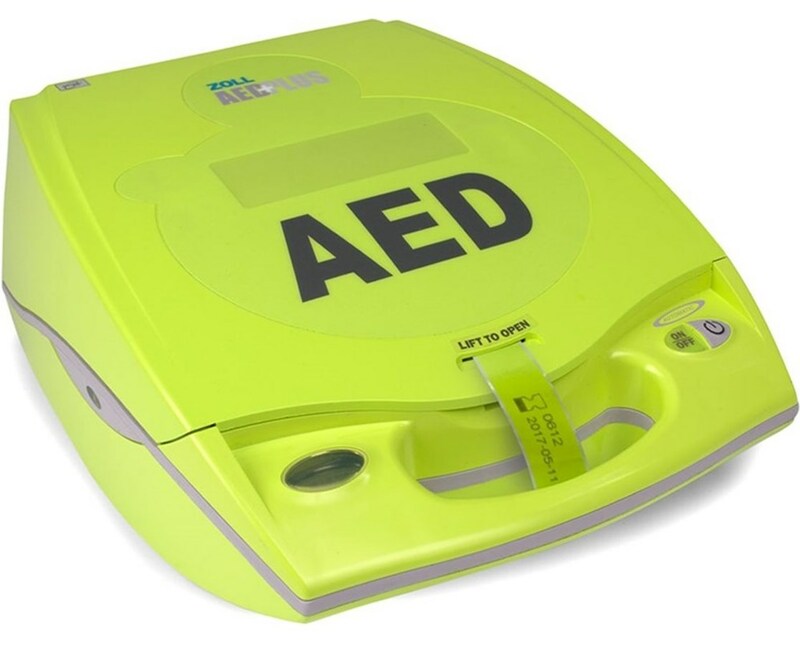 It features graphic instructions printed directly on the pad for proper placement with no second-guessing and has the longest shelf life of any AED electrode - five years! The defibrillator can safely be used on children up to eight years of age with pedi•padz II electrodes (sold separately). When connected to pediatric pads, the AED's intelligent design automatically converts to pediatric mode with appropriate energy levels and heart rate analysis. The AED Plus is ready to use immediately upon its delivery. It includes inexpensive, user-replaceable lithium batteries, a compact carrying/storage case, and a full rescue kit. The rescue kit includes all of the odds and ends necessary for use in a SCA: a CPR barrier mask and disposable gloves for rescuer protection, a prep razor and moist towelette for patient preparation, a towel for drying surfaces to be shocked, and a pair of scissors for cutting patients' clothing or other supplies. The manufacturer will program one language into the device. The defualt is English (US). Other languages available are; English (UK), Deutsch, Francais (CA), Francais (FR), French Switzerland, Nederlands, Swiss High German (Switzerland), Turk and . 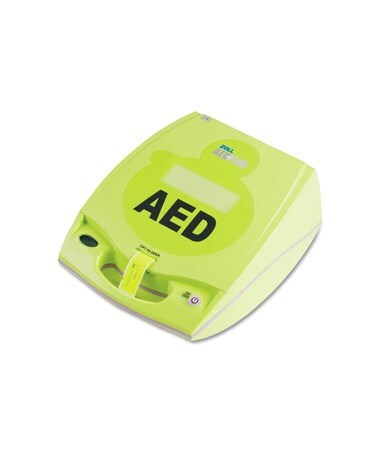 You can order this AED right now, online - simply select from the drop down menu above. Optional Fully Automatic Model for charge and shock delivery with no assistance from the side. Dimensions 5.25" x 9.50" x 11.50"
This is Product is not eligible for return. We take the responsibility to make sure it arrives in brand new working condition. Should your item arrive damaged, we will take full responsibility and replace the product at no cost to you.